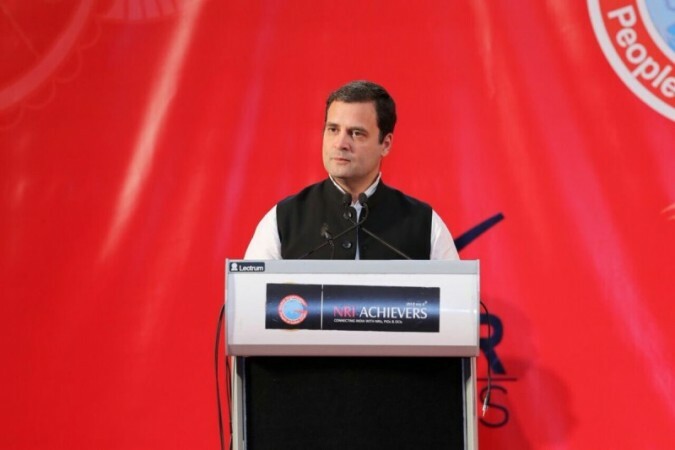 Manama, Jan 9: Highlighting how job creation in India is at an eight-year-low, Congress President Rahul Gandhi on Monday said the two threats facing India under the Narendra Modi government are inability to create jobs and the rise in the forces of hatred and division. Addressing the Indian diaspora in Bahrain here, he said: "Tragically the conversation in our country today is not about jobs, healthcare or education. The only thing India talks about is what you are allowed to eat, who is allowed to protest and what we can say or rather what we cannot say. "India today is free, but once again it is under threat. There are two clear threats facing our country today. The first is our government's inability to provide jobs for our people. Our main competitor China produces 50,000 jobs every 24 hours. India currently produces 400 jobs in the same amount of time." "It is an important figure. What China does in two days, it takes India one year to do. These are not my figures, these are figures of the government of India given in the Parliament. Job creation in India is at an eight-year-low," Gandhi said in his address at an event organised by Global Organisation of People of Indian Origin. "New investments have been lowest in 13 years. Bank credit growth has sunk to a 63-year low. To make matters worse, many in the Indian diaspora have lost hard-earned money because of arbitrary decisions like demonetisation. It landed a crippling blow to India's overall economic growth. The fact is that India can simply not afford this," he added. Underlining India was the second-most populous country with 30,000 new youngsters coming daily into India's job market, he said that not providing education and jobs to these youngsters was "a recipe for disaster". "The government's failure to creating jobs is resulting in tremendous anger and unrest in India. The youth are asking a very simple question, what are we going to do in future. This anger is visible in the streets and is rising rapidly," he said, adding the "tragedy" is that instead of focusing on what is critical issues like poverty alleviation, job creation and building a world class education system, "we see instead rise in the forces of hatred and division". Gandhi also said that activists and journalists are threatened in India. "They are shot dead for expressing their views. People are killed because of their religious beliefs, Dalits are beaten into submission, judges investigating sensitive cases die under mysterious circumstances. And through all this the government has nothing to say." Claiming India has been taken off its path of progress, he said: "We need to bring our conversation back from violence and hatred to one of progress, jobs and love between our people. And we cannot do that at home without our largest skill base on the planet - all you people in this room. "Together, we must steer India back to its original strengths, we need to make India the centrepiece of ahimsa, of non-violence, of compassion." He also said that he was in Bahrain for a purpose and that is "to tell you what you mean to your country". "That you are important. To tell you that there is a serious problem at home, to tell you that you are part of the solution and that I am here to build the bridge between your world and home," he added.